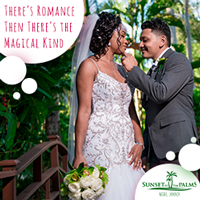 You’ve said ‘I do’ and sealed it with a kiss – now it’s time to raise a glass, along with your guests, to your newly minted married status. But what’s in your glass as you say cheers? When it comes to your cocktail hour, think beyond traditional beverages. From coffee-infused cocktails to drinks that light up, the possibilities are truly as limitless as your imagination (and budget). Here are a few expert tips and trends for kicking your reception off with a fun and fresh cocktail hour that will leave your guests happy – and a little buzzed. For a summer wedding, consider offering a selection of cocktails mixed with fruit flavored La Croix for a sweet and refreshing bubble bar. Sparkling cider based drinks, on the other hand, are perfect for a fall event. Flowers don’t just make beautiful décor – they can also make a tasty drink. Elderflower liqueur like St. Germain is a popular cocktail base and pairs well with white wine or a classic gin and tonic. Or, take the flower power to the next level with a lilac soda, lavender bee’s knees or hibiscus margarita. Garnishes are an easy way to jazz up or personalize an otherwise simple cocktail. Top off your drinks with a sprig of mint leaf, citrus peel twist, flower petals or themed stir stick for an added element of fun. Or, keep your beverages cool with ice cubes filled with herbs or fruit. To really pump up the party factor just add a little extra fun lighting to your cocktail hours, suggests Binney. “Our bars now incorporate lighting that ties in with the rest of the wedding. We use programmable LED lights for uplighting around the bar area, menu boards, displayed alcohol bottles and even waterproof lights inside our drink dispensers – makes a huge impact and totally adds to the ‘wow’ factor,” says Binney. Of course, it doesn’t matter how trendy your cocktails are if you don’t have talented bartenders creating them.